As we approach our 40th anniversary, we know that a lot has changed in the anti-hunger movement over that time. We are experts in the field and know our work well, but we wanted to know more about what the people of Maryland know and think about hunger, an issue that touches more people than many realize. So, we partnered with an Annapolis-based firm to conduct a perception poll of Maryland residents. In the survey, we polled a wide range of people, stretching from Cumberland to Cambridge to gauge opinions on how hunger affects our friends, our neighbors, our relatives. We learned that most Marylanders are aware of our state’s hunger problem, believe it can be solved, and want to see more resources devoted to ending it. This is a powerful statement, one that 84 percent of people polled agree with. Considering we live in one of the wealthiest states in the country, hunger shouldn’t have this kind of power over our neighbors. The very nature of hunger makes it a complex social problem. Changes in the local or national economy, job and training opportunities, health, personal and family issues can all force people into different stages of food insecurity, sometimes with little or no notice. It is our responsibility to understand what hunger looks like in each of the 21 Maryland counties and Baltimore City that we serve. Those 22 areas comprise more than 10,000-square-miles, ranging from densely populated inner-city areas to rural towns where the need is more spread out. We distribute enough food every day to provide more than 100,000 meals to vulnerable populations, but a complete solution to the problem of hunger has proven elusive. While more than three-quarters of Marylanders (78 percent) agreed with the aspiration, “hunger can be eliminated in Maryland” actually doing it is much harder than most might think. It takes real-time data to know precisely where the need is. It takes an adequate supply of nutritious foods, and trucks to deliver that food. It takes 1,250 statewide distribution partners to pass out the food to the children, seniors, working families and veterans who need it. And we know it is important to many Marylanders. More than half of people polled consider hunger a priority that is at or near the top on their list of challenges that need to be addressed. We couldn’t agree more. We are continually improving our programmatic approach and seeking ways to expand our reach so that we can get more food to more people, as quickly as possible. We know this work better than anyone else in our state, but reduced food donations from traditional sources due to supply chain improvements and changes in the industry, combined with our increased focus on nutrition, is making feeding our neighbors in need more difficult (and more expensive) than ever. Butch Langenfelder, MFB’s food sourcing manager, is focused on exploring innovative ways to rescue more good food out of the waste stream. These new challenges mean that we have to devote more time and resources to maintain a steady influx of food. We are strategically engaging in new partnerships, developing new programs and uncovering new sources of food, including new Farm to Food Bank Partners such as Catoctin Mountain Orchard in Western Maryland. One surprising aspect of the poll was that more than half of respondents think that we receive most of our financial support from the state government when in reality, the state of Maryland provides just 27% of our philanthropic revenue. That’s why your support is so critical to our continued ability to provide relief for the short-term effects of hunger on our neighbors, and our efforts to help put them on the path to long-term self-sufficiency. Thankfully, 42 percent of people polled said they “would like to be more engaged in the effort to end hunger in Maryland.” With about 6 million people in the Old Line State, that means we have a LOT of allies and a LOT of potential support. Foundations, corporations, and companies in Central Maryland that provide critical funding. Farmers on the Eastern Shore that furnish nutritious produce. Neighborhood organizations in Western Maryland that form innovative community partnerships to battle hunger. Feeding Maryland’s hungry is truly a statewide effort. But not all food bank support is in the form of giving money or physical goods. In fact, volunteers are every bit as valuable to us. In FY17, volunteers donated 43,000 hours of time at a value of more than $1.2 million. Not only does their service impact our bottom line, and the lives of food-insecure Marylanders, it affects the well-being of the volunteers themselves. 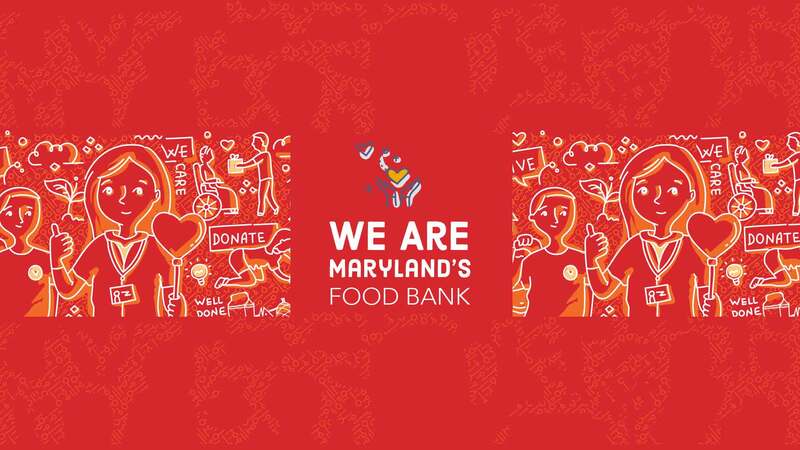 We are Maryland’s Food Bank, and you are Maryland’s Food Bank. We couldn’t possibly do what we do without you. Ready to join in the fight to end hunger? Dial 410.737.8282 and ask for Laura Urban. She’ll match you up with an opportunity that will fulfill your interest in helping your hungry neighbors. If you are already familiar with our volunteer program, sign up for a shift now! If a Church is small but still every week serve food and have to pick up food due to shortage of space are they able to use the food bank some how? Our community outreach serve about 100 people every Saturday , starting at 12 noon till all gone. Giant was giving us aide but they close the store located at Liberty Rd and Milford Mill Rd in baltimore, which leaves us short of non perishables like can goods,bread,cakes, sometimes milk, cheese, noodles, juices, water, chips and many other items at times. Does cost if we were to come our own weekly or do you all allow that. We are 501 c 3, tax exempt. I have passed your message along to our Programs team, but you are more than welcome to reach out to them at 410.737.8282. I am trying to help out the Spanish ministry at our church. I have tried to find out what information they need to receive your help. At this time I myself receive food from the Charles county food banks. so I’m unable to offer any assistance. Please have someone from your church call us at 410-737-8282 and ask to speak with someone on our Partner Services team.